Circuit Analysis of the Marshall JMP50 Model 1987 "Plexi"
The normal channel's first stage preamp has a fully bypassed cathode resistor and a volume control without a bright bypass capacitor, resulting in voltage amplification and a flat frequency response. 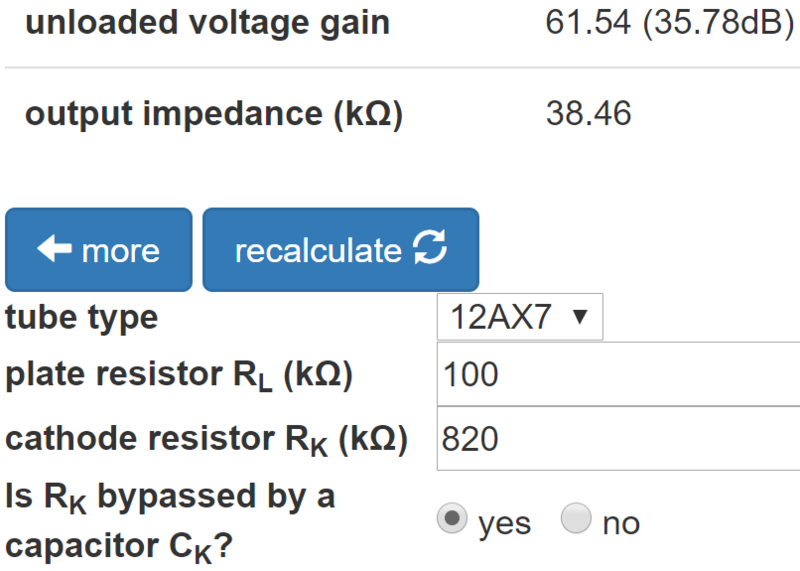 According to the 12AX7 calculator, the 820Ω cathode resistor creates a slightly warm -1.4V DC grid bias. Input headroom is 1.4V peak (-0.1dBV). Without a boost pedal, the the stage is not likely to be overdriven. The DC current load on the power supply is about 0.9mA. 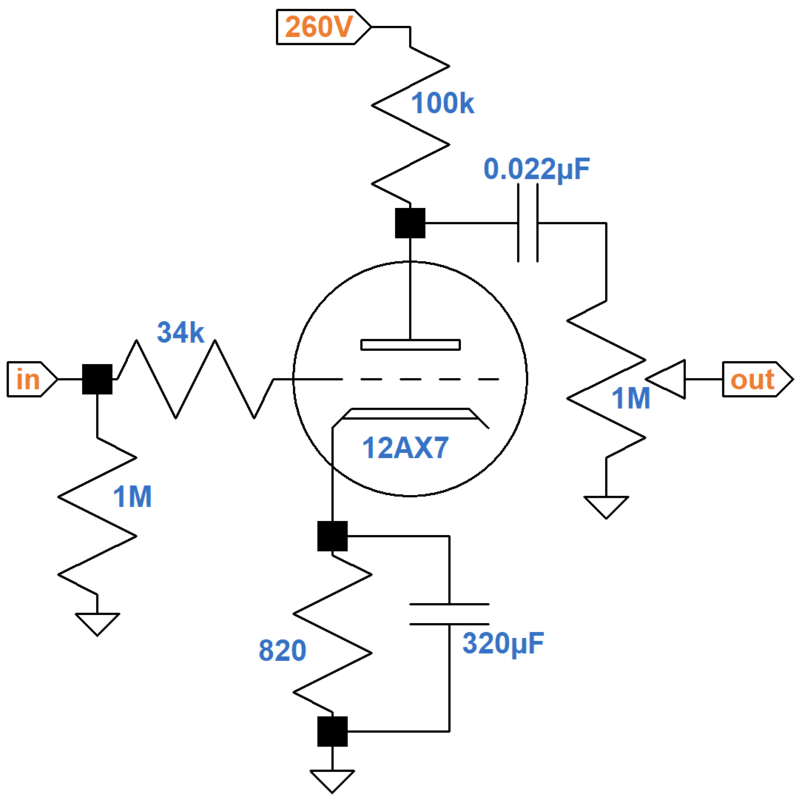 A 12AX7 voltage amplifier with a 100kΩ plate load resistor and a fully bypassed cathode resistor has become ubiquitous in guitar amplifier design. The Preamp Gain and Output Impedance calculator displays familiar values: 36dB and 38kΩ for unloaded voltage gain and output impedance. 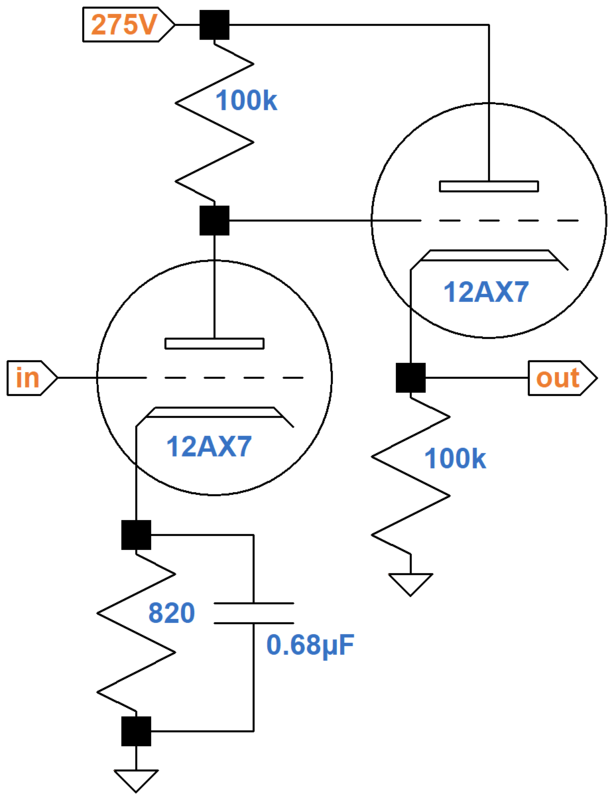 The 1MΩ volume control is a light load, so the loaded gain is reduced only slightly: 1MΩ/(1MΩ + 38kΩ) = 0.92 (-0.3dB). Loaded gain is 35.7dB to the top of the control. The bright channel has a partially bypassed cathode resistor. 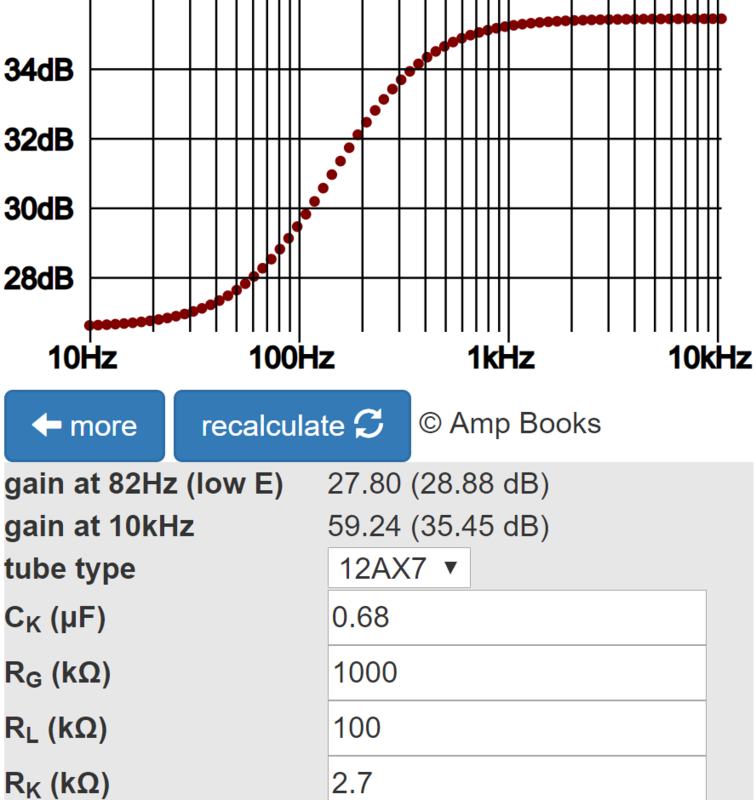 The Cathode Bypass Capacitor calculator shows that there is almost 7dB bass cut due to negative feedback from cathode degeneration. The 5000pF bright bypass capacitor allows treble to bleed through the attenuation of the volume control when it is turned down. This is motivated by human perception — the ear is more sensitive to midrange than it is to bass or treble. 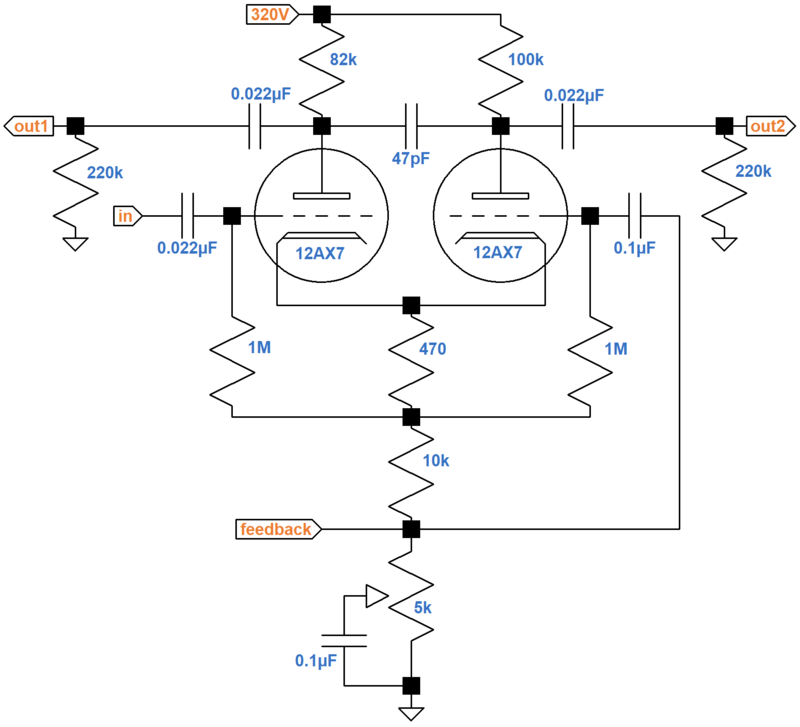 A volume control gets hit with a double whammy for treble, because the top of the potentiometer adds series resistance to increase treble attenuation caused by Miller capacitance. In contrast to the Fender Bassman 5F6-A, the 820Ω second stage cathode resistor is partially bypassed by a 0.68μF capacitor. This boosts treble by removing cathode degeneration for high frequencies. The Cathode Bypass Capacitor calculator shows that the boost is not as dramatic as in the first stage bright channel because the cathode resistor has a smaller value. 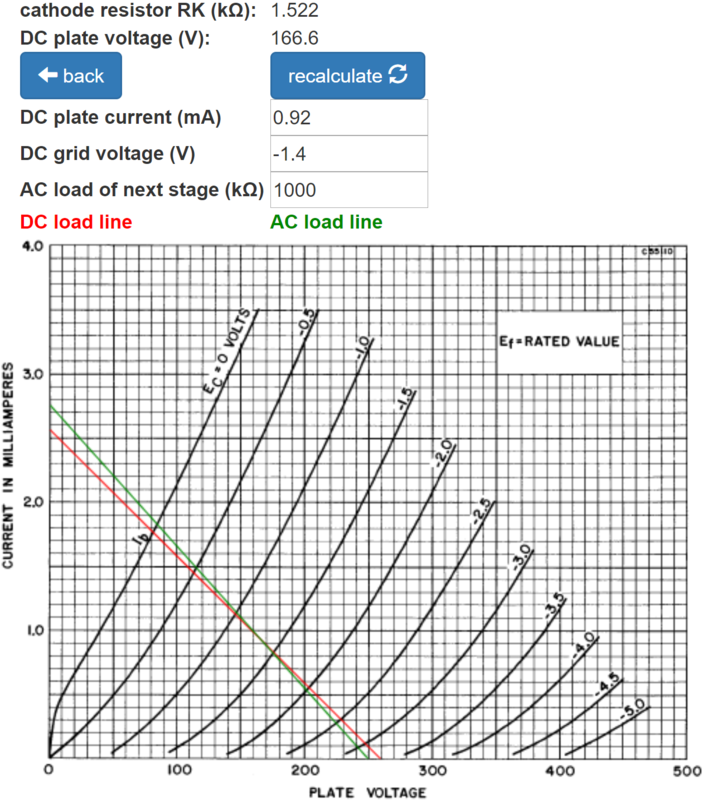 According to the 12AX7 calculator, for a plate supply voltage of 275V, a 100kΩ plate load resistor, and an 820Ω cathode resistor, the DC grid bias is a very warm -1V. The DC plate voltage is only 152V, which facilitates a reduction in grid-to-ground voltage for the DC-coupled cathode follower driven by this stage. DC current load on the power supply is about 1.2mA. The Cathode Follower calculator indicates that the output impedance is only 615Ω, which facilitates driving a tone stack that demands a lot of current. The tone stack modifies parts values of the Fender Bassman 5F6-A stack to reduce insertion loss by narrowing the range of frequencies defined as midrange. Here is the tone stack response (dB gain versus frequency in hertz) with the middle control at 50-percent rotation. 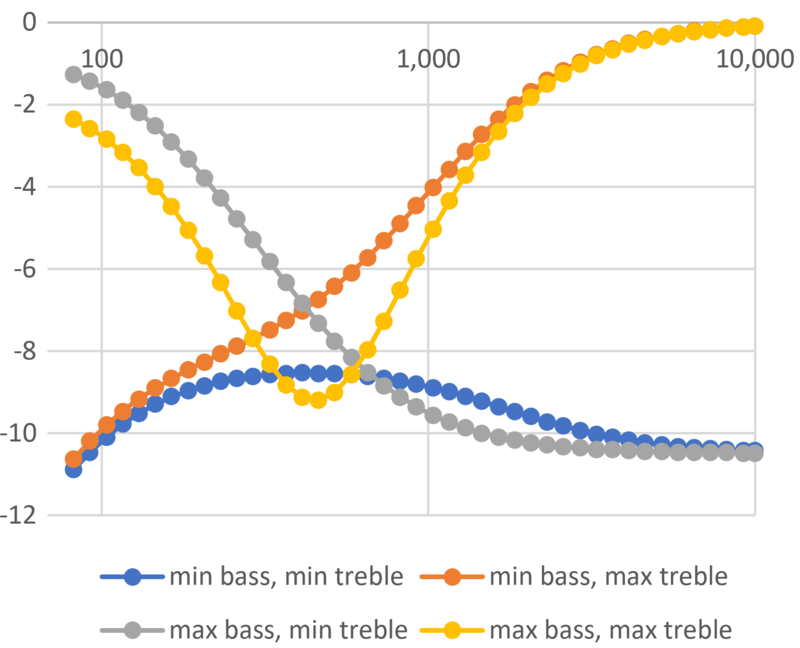 Insertion loss at midrange is about 3dB less than for the 5F6-A Bassman. The phase inverter tweaks a few of the Bassman's parts values. To compensate for imbalance between the two phases, the plate load resistor value for inverted phase is reduced to 82kΩ. The 10kΩ + 5kΩ = 15kΩ tail carries the current of two triodes, so the equivalent for one triode is 30kΩ. Adding this to the average 91kΩ plate load, the total resistance in series with the tube is 121kΩ plus the effective cathode resistor value. Since it also carries the current of two tubes, the latter's effective value is double the resistor's 470Ω value: 940Ω. 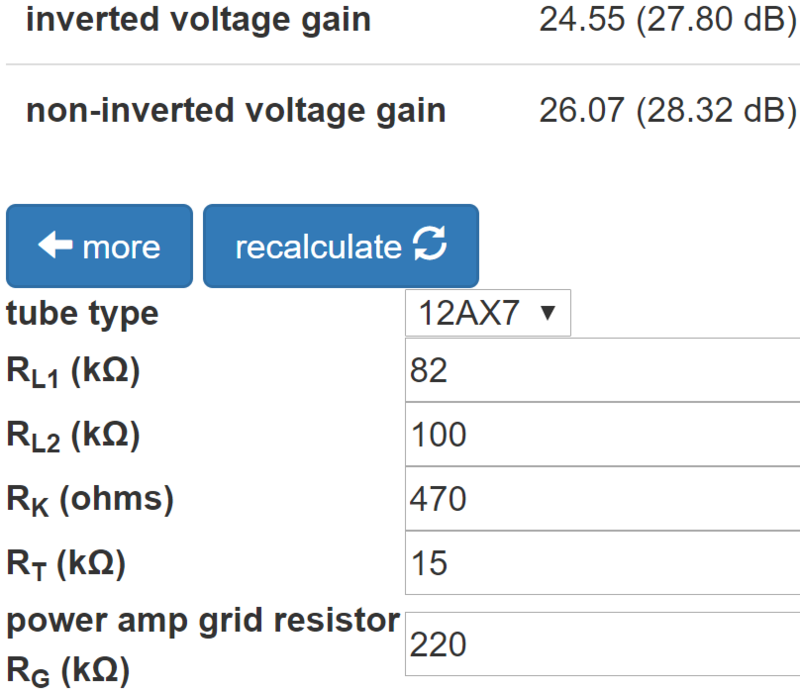 For 121kΩ and a plate supply voltage of 320V, the 12AX7 calculator indicates that the DC grid bias is -1.15V. DC current load on the power supply is 1.2mA per triode, for a total of 2.4mA. 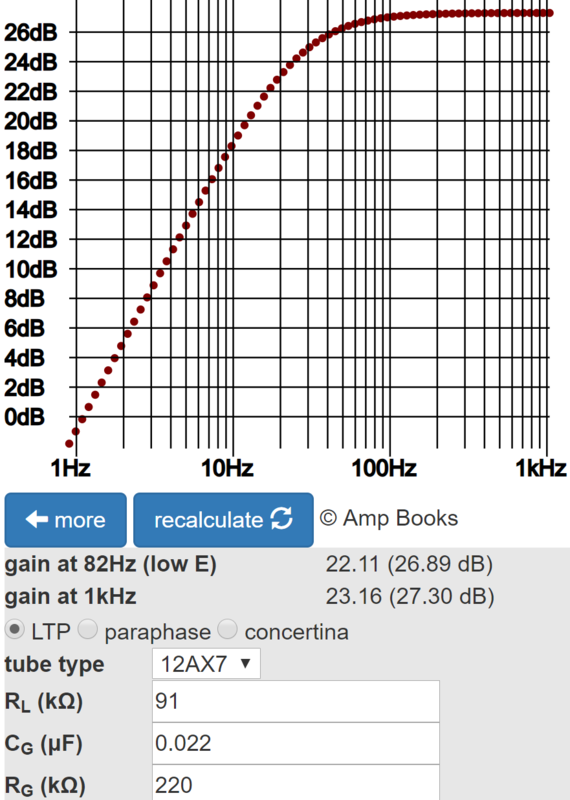 The Long Tailed Pair calculator indicates that the stage has a gain of about 28dB with a slight imbalance between phases that contributes to 2nd-harmonic distortion. The Model 1987 uses 0.022μF coupling capacitors to drive the power amp, compared to 0.1μF for the 5F6-A Bassman. 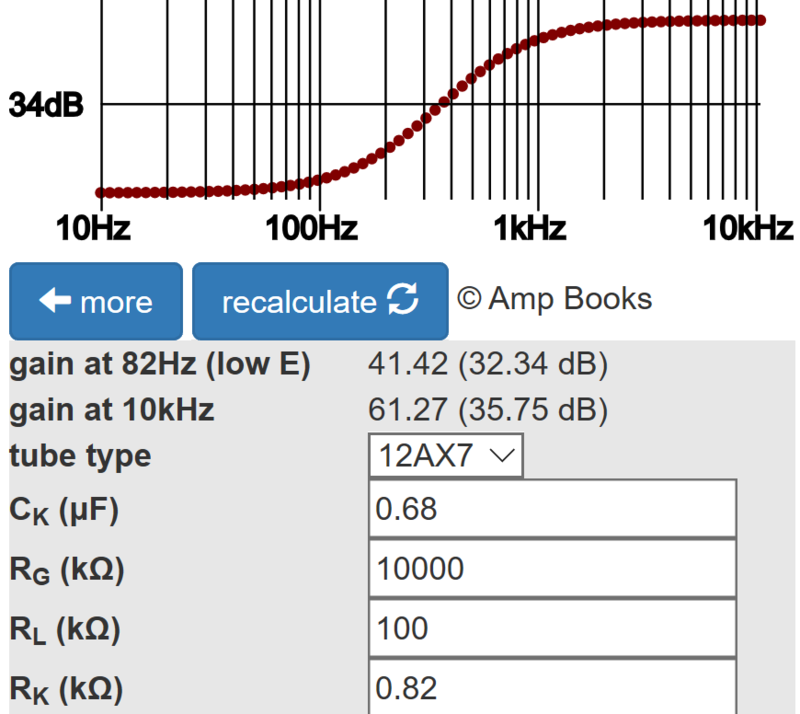 The Phase Inverter Bass Response calculator shows that the smaller coupling capacitors create only 0.4dB attenuation at 82Hz compared to midrange. The first Marshall, the JTM45, used a push-pull power stage identical to the Fender Bassman 5F6-A. Subsequent Marshall designs used EL34 pentodes instead of Fender's 6L6 beam power tetrodes to create an entirely new sound for which these amps have become legendary. The JMP50 Model 1987 also eliminates the 470Ω screen resistor found in the 5F6-A and JTM45. While primarily intended just to suppress radio-frequency oscillation, the screen resistor value also has a significant effect on harmonic distortion at high power levels. Pentodes and beam power tetrodes have distinctively different characteristic curves, and this translates into significant differences in performance. When pentodes operate at low plate voltages, the plate doesn't create enough of an electric field to draw electrons away from the screen and they accumulate on the screen side of the suppressor, many returning to the screen. The result is that the conditions found on the cathode side of the suppressor are very similar to those found near the cathode, so a virtual cathode forms in this region. These effects result in characteristic kinks in the lower left of the EL34 plate characteristic curves. 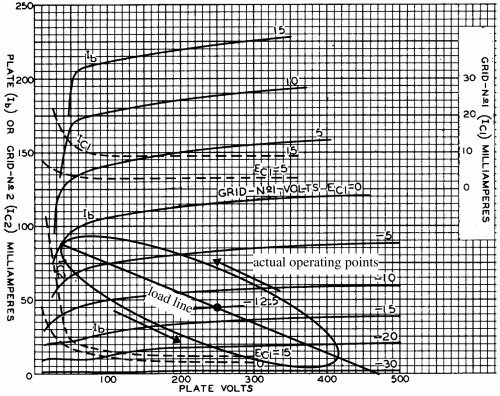 When the grid of a beam power tetrode is very negative, the plate current is low and there is very little space charge between the electrodes. This causes less suppression of secondary electrons. At low plate voltages and high plate currents, a large amount of space charge causes a virtual cathode to form between the screen and plate. 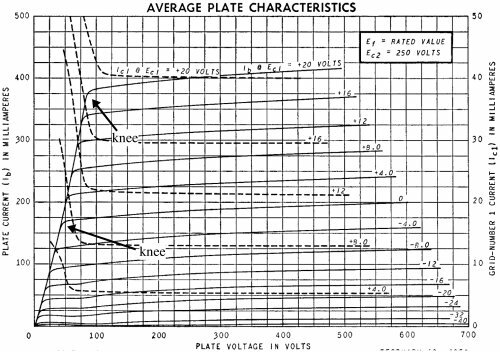 As the plate voltage decreases, the tube abruptly transitions from conditions where the plate voltage has little effect on plate current to conditions where the plate voltage is the most dominant factor. This produces distinctive knees in the curves, like these for the 6L6GC. 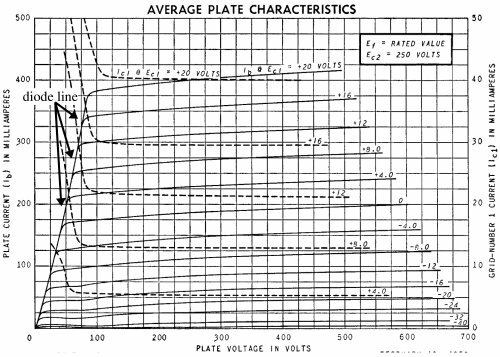 At the left side all of the curves come together, demonstrating that at these low plate voltages the grid has lost its ability to control the plate current. The tube is thus acting as a diode, where plate current increases rapidly with increasing plate voltage. 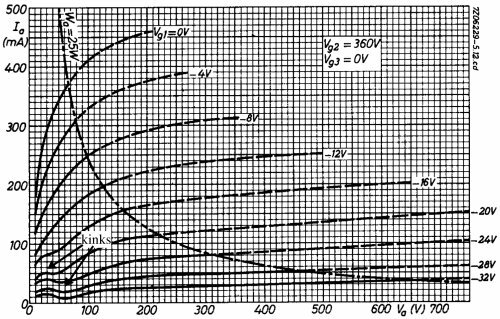 Because of the space charge effect, beam power tetrodes tend to have much sharper knees compared to pentodes and clearly defined diode lines, as demonstrated by the following figure, where two 6L6GC curves are superimposed onto EL34 curves. For both tubes the screen is at 250 volts. 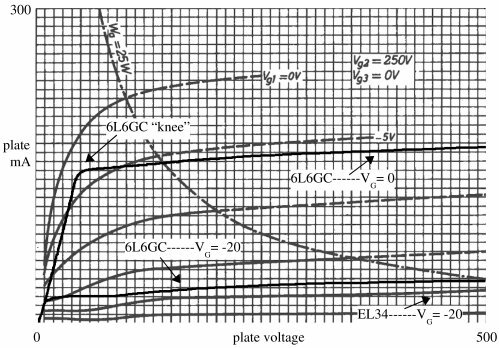 The characteristic differences between pentodes and beam power tetrodes at low plate voltages, especially near the knee of the zero-grid-voltage curve, affect power amp distortion at high power levels, even if the speakers act as ideal resistors. Using real-world speakers, however, the tonal effects become even more significant. 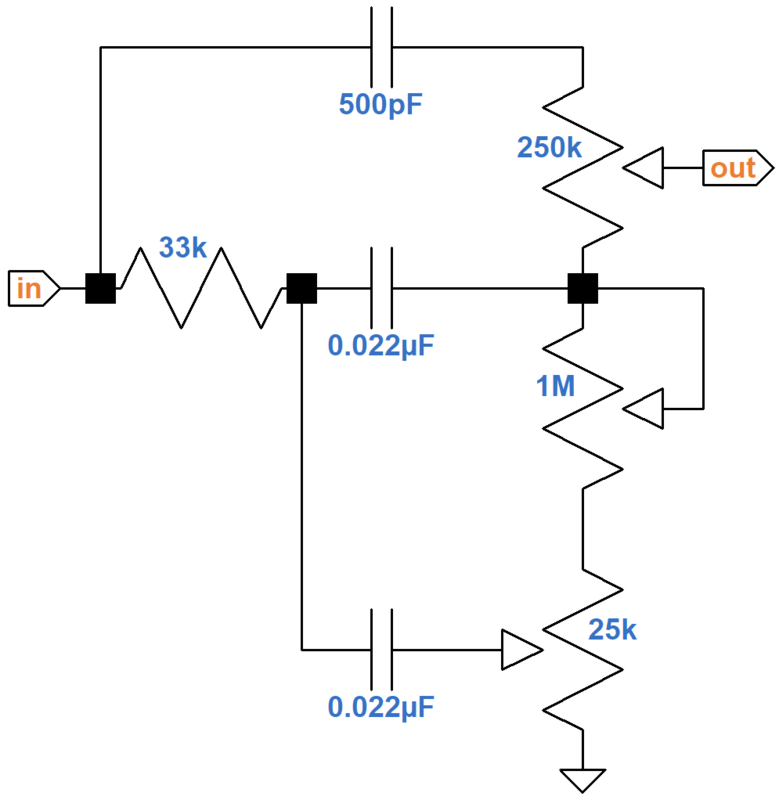 The reactance in the speaker, which is very dependent on frequency, transforms the operation of the amplifier from a straight line into an ellipse, as shown in the following figure for a single-tube 6V6 amplifier. Similar effects are seen in push-pull amplifiers like the 5F6-A and JMP50. The downward path of the ellipse cuts through the curves at lower plate voltages, where the characteristics between the two tube types differ the most. Beam power tetrodes have precisely aligned control and screen grids that channel the electrons between the screen windings. This reduces the ratio of screen to plate current, making it less than in a pentode. This characteristic can be a double-edged sword, however, because manufacturing variances can cause greater differences in screen current compared to pentodes, up to 100 percent in some cases. 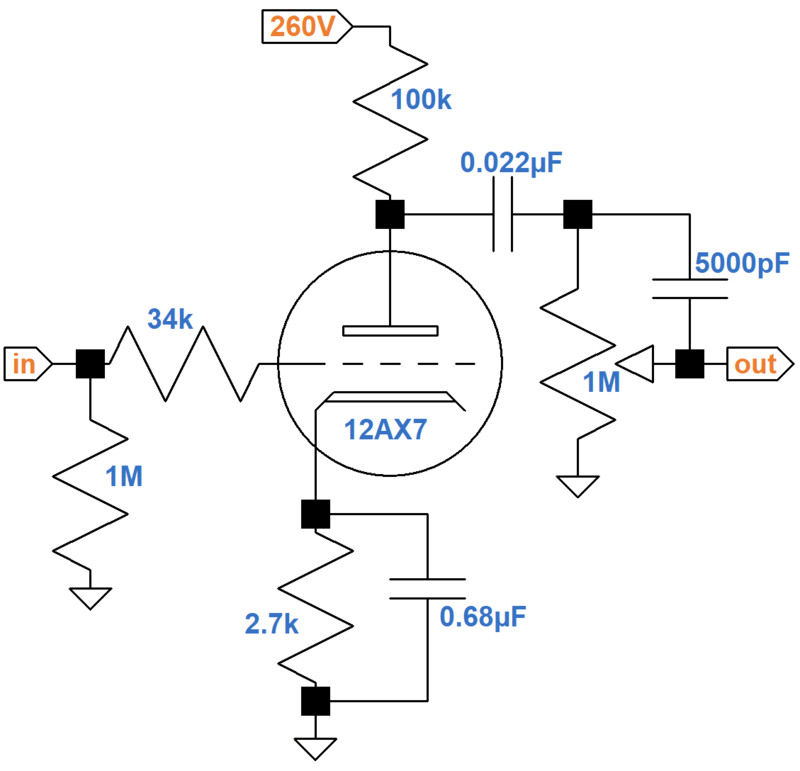 This affects the voltage drop across any resistors placed in series with the screen. For both tube types, the screen current and screen dissipation increase rapidly as the plate voltage drops below the knee, and frequency-dependent changes in speaker impedance while operating at high power levels often push the tube into this condition. In summary, pentodes and beam power tetrodes are constructed quite differently, which translates into significant differences in their operating characteristics and tonal qualities. The two types of power tubes sound differently in a guitar amp operating near full power, something that is no surprise to musicians. The screen resistor value also has a substantial effect on harmonic distortion. The Fender Bassman 5F6-A and the Marshall JMP50 Model 1987, while sharing the same push-pull circuit heritage, offer completely different sonic characterisitcs.